Philippe Coutinho’s late goal handed Liverpool a crucial victory in a superb match. Brendan Rodgers named his expected XI, which meant Joe Allen – often an option in big games – only on the bench. Manuel Pellegrini played Gael Clichy ahead of Aleksandar Kolarov because of his his defensive discipline, and decided Sergio Aguero wasn’t fit enough to start the game, so continued with a 4-2-3-1 and Edin Dzeko upfront alone. This was the classic game of two halves – Liverpool were dominant in the first period, Manchester City were superior after the break. The key to this contest was the tempo of the game – these are two completely different sides, and there was a huge contrast in the type of match they desired. Liverpool have taken to playing an extremely frantic style of football, pressing relentlessly high up the pitch, making more tackles (22.1 per game) than any other side in the Premier League, and attacking very directly through their prolific front two, plus Raheem Sterling. Manchester City are a calmer side, almost Spanish in style, who prefer patient matches where they can slowly but surely gain the upper hand through clever passing patterns. Two sides in the division, Swansea and Southampton, average more possession than City – but Pellegrini’s side play a higher proportion of their passes in the opposition third of the pitch, retaining the ball in more dangerous zones. Therefore, it was basically about who could set the tone of the game. The first half was played at an incredibly high speed, and Liverpool dominated, fully deserving their 2-0 lead based upon the balance of play. The game settled in the second half and City were sublime. This corresponds with the general pattern throughout the season – Liverpool have the best first half record in the Premier League, City the best second half record. In terms of shape, the key decision was Rodgers selecting a midfield diamond, rather than the 4-3-3. It’s still rare to see the diamond used in English football – it gives opponents a different challenge, and part of the reason Liverpool dominated in the first period was because City struggled to get to grips with them in the centre. 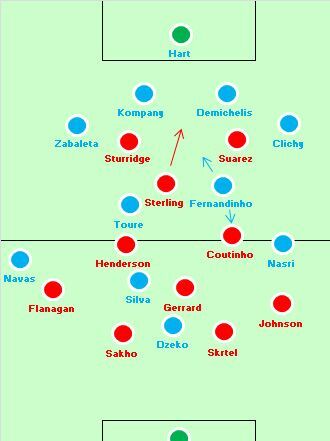 Of course, the initial reason Rodgers started playing the diamond was to get Luis Suarez and Daniel Sturridge playing upfront together, and in the opening 10 minutes City’s centre-backs looked uncomfortable with their movement. However, Clichy and Pablo Zabaleta tucked inside and kept the defence narrow, which meant neither Suarez nor Sturridge caused problems in the channels, which is where they’re at their most dangerous. 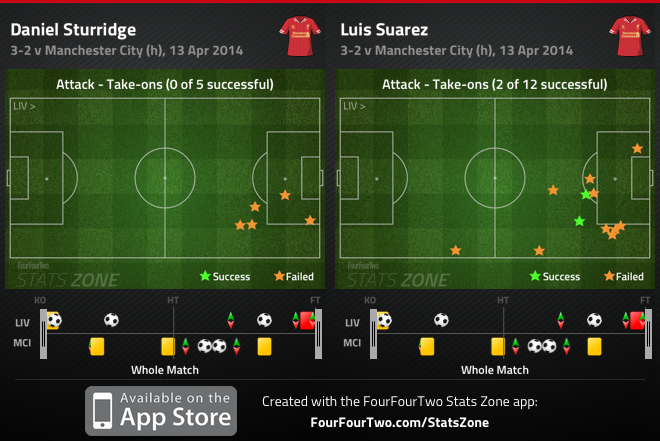 Both were actually very quiet throughout the game, with Suarez enduring one of his poorest games of the campaign. City’s problem was in the centre of midfield, where they were overrun 4 v 3, and unsure how to deal with this problem. There were two individual battles that were obvious – David Silva was playing close to Steven Gerrard, which on paper was probably City’s most promising area, as Gerrard isn’t great in a pure positional sense alone in front of the back four, and isn’t mobile enough to constantly track Silva’s clever drifts out wide. The threat of Samir Nasri moving inside was also likely to worry him, too. But as City struggled in the opening stages and were unable to feed Silva, this wasn’t a problem – Gerrard played very deep, often as a third centre-back (from where he made one superb last-ditch tackle on Dzeko). He hit some good diagonals, but this wasn’t a huge problem for City. The other clear individual battle was Jordan Henderson against Yaya Toure. Rodgers has always made occuying Toure a key part of his strategy against City, and in the opening stages the Ivorian was barely noticeable. Henderson’s job wasn’t to shuttle forward and cause problems in the final third, as he’s done frequently this season, but instead simply to ensure Toure didn’t influence the game. But again, this battle wasn’t a major problem for City – the players were cancelling each other out. Their real problem was with Fernandinho, who was overrun in the opening stages. This has, quietly, been a consistent issue for City this season – Fernandinho’s had a fine first season in English football, is a thoroughly good midfielder, and covers space extremely well. But he’s not a natural holder, and the lack of defensive support he receives from Toure means City can be exposed between the lines. Fernandinho had a particularly thankless task here, because he was unsure whether to move up the pitch to close down Coutinho, or drop back and ensure Sterling couldn’t collect the ball between the lines. Fernandinho is naturally an energetic player who presses, and he probably took the latter option too often. 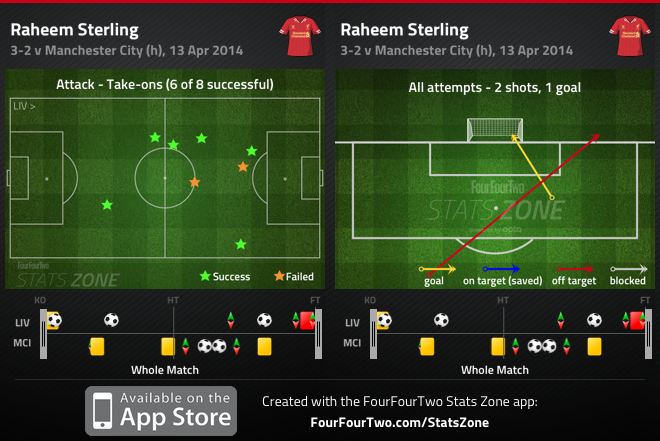 It wasn’t ideal to leave Coutinho free, but Sterling in space closer to City’s goal was a bigger problem. Sterling was Liverpool’s best player. His positional versatility this season has been extremely surprising – he’s played left-wing, right-wing, right-wing-back and now as a number ten, the most demanding role Rodgers has asked from him. He’s not always effective from this role in slow, patient matches, but in the opening minutes he here was superb, driving forward to open the scoring from a centre-forward position, as he went untracked by the two centre-backs. He found oceans of space between the lines, and later drove forward in possession for the spell of pressure that resulted in Liverpool’s second goal, headed in by Martin Skrtel. But he wasn’t afraid to drift to the flanks either, sending in a fine early cross which Sturridge couldn’t quite make contact with. The shape of the game changed on 20 minutes, when Toure was forced to depart through injury, with Javi Garcia on to replace him. This changed the balance of the City midfield, as Fernandinho now played the Toure role (his more natural position) while Garcia sat deep. The Spaniard was booked within a minute of coming on, which meant he couldn’t storm into tackles any more. He simply had to sit deep in front of the defence. This wasn’t necessarily a bad thing. Liverpool had less space between the lines, Sterling wasn’t quite so visible, aside from on counter-attacks, and Coutinho was more regularly the free player. Eventually Nasri was dragged inside to help out, although that in turn left space on the flank, and allowed Glen Johnson to drift forward unmarked. At this point, you couldn’t help wondering – why were City being overloaded everywhere? Why did Liverpool always have a free player? And, of course, the answer was that City were basically playing 4 v 2 at the back. That was their secure zone, and they kept Suarez and Sturridge quiet. The downside was a vulnerability to players in deeper positions. Zabaleta’s first half display summed it up – loads of interceptions, but absolutely no quality on the ball. That was why City were secure defensively, but overloaded higher up. Sometimes a 15-minute break can be more effective at changing a game than a formation switch or a substitution, and City emerged from the half-time interval refreshed and with a determination to dominate the game. There was no rational explanation for why the game was so different, other than the possibility that Rodgers ordered his side to sit deep and counter-attack, as they’ve done so often in big matches this season, rather than simply saying ‘more of the same, lads’. Whatever the reason, City were now in control and Liverpool’s main problem on paper – Silva v Gerrard – became a huge issue on the pitch. 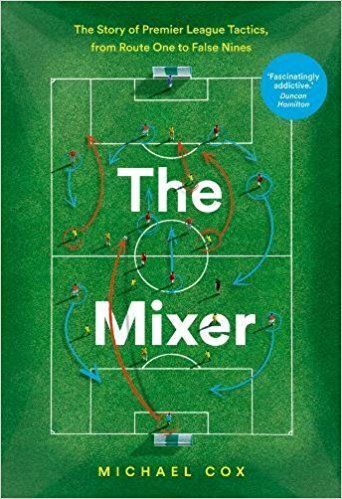 The Liverpool captain simply couldn’t deal with Silva’s movement into pockets of space, his sudden bursts over 10 yards, or his ability to play the ball first-time, then move into space to receive another pass quickly. For a 15-minute spell, Silva was absolutely magnificent. At this point, it was very surprising Rodgers didn’t make a change. The Liverpool midfield had dominated the first half, but on the back foot this quartet looks much less secure. If you’d been told at the start of the season that a Gerrard-Henderson-Coutinho-Sterling midfield diamond was going to fire Liverpool to the title, you’d have laughed – that’s (a) a player whose acknowledged weakness is his lack of discipline, (b) a box-to-box midfielder, (c) a number ten and (d) a winger. It’s remarkable they’ve managed to become a cohesive unit, not so remarkable they’re occasionally exposed defensively. Rodgers had two good options on the bench, Allen or Lucas Leiva – who had been introduced at West Ham last week to play on the right of the diamond, alongside Gerrard. But no change was forthcoming, and Silva destroyed Liverpool for the third ‘quarter’ of the game, working the pitch on both flanks, scoring the first and forcing the second. Also important in City’s comeback was the introduction of James Milner, who played narrower than Jesus Navas and was more involved in play. While City had successfully cooled the tempo of the game, it helped that they had another player who was capable of covering a lot of ground, and a stereotypically ‘English’ type of player. (Liverpool started with six English outfielders, City none, for the record.) He more likely to make things happen than Navas, and contributed to both of City’s goals – he and Silva have a better natural partnership than any other two players at City. Then came more changes. Rodgers was forced to remove the injured Sturridge, and in the absence of a top-quality like-for-like replacement (Iago Aspas was the closest thing) he summoned Allen and eventually moved to what he called a 4-3-3 – although it was more like 4-1-4-1 as City dominated. In truth, Sturridge’s injury might have saved Liverpool here. Rodgers had shown no sign of making a change until the forward came off, and he might have been reluctant to have removed the SAS, or Sterling who had been Liverpool’s brightest attacker. Being forced into a change meant Liverpool had a more disciplined midfield and were less open down the flanks. City were still on top, but less dangerous. Liverpool’s problem, however, was that Suarez surprisingly offered little outlet on the break as City dominated – but then neither had Sturridge. Then there was the other major substitution – Aguero on for Dzeko. Pellegrini simply couldn’t resist using his most exciting striker, but Dzeko had done quite well upfront, holding up the ball and allowing Silva, Nasri and Milner – plus Fernandinho too, sometimes – to use him as the central pivot to play around. Aguero is a more straightforward striker, and while he nearly teed up Silva for a winner, the pass was overhit and he contributed little else. It would have been a shame to leave Aguero on the bench, but when City had the opposition pinned back behind the ball, Dzeko was a better option. A pacey striker (even if he has many other qualities) isn’t the ideal supersub with 30 minutes remaining. Teams tend to start defending high up the pitch before dropping increasingly deep – it’s often said that pace is invaluable against tired defenders, but tactically it’s more useful earlier in games. A more pertinent analysis is more simple: Aguero never looks dangerous when not 100% fit. At his best he’s unstoppable, but when there’s a doubt surrounding his sharpness, he plays within himself. Coutinho’s winner came following a Kompany mistake, and was completely out of the blue – following a set-piece, at a time when City still appeared more likely to score the decisive fifth goal. The only analysis needed concerns Kompany. Having been injured in training yesterday, he wasn’t 100% fit here, and allowances should made for his underperformance. Nevertheless, he was caught out for all three goals – he was unable to track Sterling’s run for the first, lost Skrtel for the second, and sliced a clearance to Coutinho for the third. Kompany’s mistakes aren’t as rare as many suggest. The only surprise about this error was that it was committed inside his own area – that’s the Belgian’s strong zone – he’s usually more vulnerable high up the pitch. Over 90 minutes the game was extremely evenly-balanced…although it was never evenly-balanced at any one time. Liverpool dominated, then City dominated, and the game was basically won because Liverpool managed to nick a goal during their spell of weakness. Liverpool’s strength came in the centre of the pitch, with their use of the diamond. City concentrated on minimising the space for the SAS to operate in, although were vulnerable to Sterling’s forward runs. City thrived when the tempo of the game dropped, and just as Sterling epitomised Liverpool’s play, Silva did something similar from the same position – with Milner on to help him. Overall it was a fantastic game, played with incredible intensity from the start until the finish. Well done Michael. Was confused when the commentators (although it is, after all, America) gave Gerrard the man of the match. I thought it was plain to see that Silva took control of the game in the second half and was really the only force driving City forward. A) As a player (I hold Henderson more accountable, although Coutinho should have been aware as well), drop deeper in order minimize the amount of space available between the lines? While there were a number of instances where Henderson dispossessed Fernandinho, this was 40 yards from goal and Fernandinho isn’t exactly able to provide that defence-splitting ball. B) As a manager (as you mentioned) bring on Allen or, especially, Lucas? Just something I noticed. Will be interesting to see what Rodgers does against Oscar’s work-rate and movement. Who do u think is the better replacement for Henderson in the next few games? Allen or Lucas? three cheers for the paragraph about Kompany. Well said, and totally on the mark. I thought City coming into the game at the end of the first half and through much of the second was down to Liverpool fatigue more than anything City were able to change on their own. City couldn’t cope with Liverpool’s pressing in the first half an hour or so, and it was only after Liverpool slowed down that City was able to come into the game, first because they had more time on the ball to get their passing game going, and second because fatigue robbed the Liverpool players of their touch… they couldn’t keep the ball when they did win it back. The Milner substitution was a fantastic decision from Pellegrini though. The substitution coupled with Silva coming into the game, popping up all over the pitch as Liverpool tired changed the game in the second half. The Aguero substitution on the other hand, definitely hurt City more than it helped them… Dzeko was playing well and increasingly looked like he was going to score. The media’s attitude to Kompany and Demichelis is bizarre. Once a narrative is decided, it takes a hell of a lot of evidence for the collective dogma to change. Demichelis was pretty good today but you’ll not hear much praise for him. I also thought Rodgers was very slow to act when City started to dominate around Liverpool’s box. Lucas should have been introduced to track Silva. Aguero was the wrong option from the bench, perhaps Negredo might have contributed more. Part of this probably comes from the fact that Kompany is likeable, intelligent person. That he can form a proper sentence doesn’t hurt him neither. True. But he was awful on MOTD! Afraid to say anything and thus offered nothing. Although I agree that Kompany is no longer one of the best centrebacks in the world,I’m genuinely curious as to which players are. I’ve heard plenty of praise on Thiago Silva, but I do not really watch Ligue 1. What centrebacks are considered the best currently? Furthermore, who do you consider to be the best fullbacks? Good question. Pepe from Real has a really good season, Hummels is definitely there, who else? I think the reason Thiago Silva is better than the likes of Hummels, Ramos, Chiellini and the others is that while he has the same level of game, he is just so much more consistent than these guys, very rarely making mistakes, which is the most important thing for a central defender. IN response to the remarks about Kompany’s image in England, I think he gets away with the ‘lionhearted captain’ thing. He’s a real leader, seems a reasonably intelligent guy and is very popular with fans, yet somebody like Demichelis, even if he had a better game, is always going to get flak because he’s the old, slow, unglamourous guy signed for nothing. It’s a double standard for sure. One criticism I have for Kompany is that, bright guy that he seems, he never seems to learn from his mistakes. We’ve seen Koscielny improve the hard way to become a really good defender, yet Kompany makes the same mistakes repeatedly. 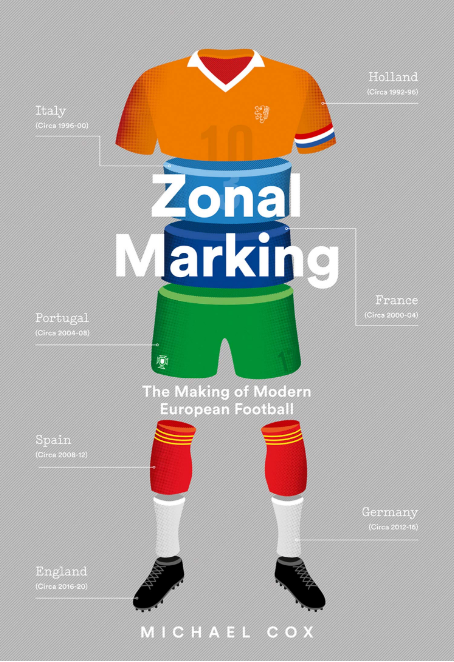 Zonal Marking is the only analysis I’ve seen that constructively points this out. These are imo better Cbs this season. Pique, Benatia, Cahill, Hummels(started poorly but has found back the form that made him the best german cb), Boateng, Pepe. The English press love Kompany because hes exactly what they believe a great English CB should be. Demichelis Would probably be better at another club like Chelsea. Till he got sent off after being left exposed by his teammates, he was doing a great job on messi. I too thought Rogers should have brought on Lucas earlier. But you have to wonder if its because he would rather them have a higher chance of scoring, than not conceding. As a lfc fan, I don’t think we’re built to defend. Skertel etc are all liable to do something nuts under pressure. May I ask why its tactically better to start pacey guys at the start of the game? Is it because everyone else is already playing at a high tempo? Its because the other team is defending higher up the pitch, which means more space behind the backline for the front men. When defending deep, space is gone, and other qualitys are preferable. Because earlier on, teams tend to play higher up the pitch, meaning there is more space behind the centre backs for a pacey attacker to exploit. Precisely this is why I think the Liverpool/Chelsea game will be so interesting. This season, Chelsea are happy to defend deeper than most teams and are willing to sit at 0.0 for an extraordinary amount of time, feeling their way into the game rather than trying to force something early on. To be honest, I can’t see how Liverpool will get much out of the game. With Chelsea defending deep, pace is no longer an issue, and with Matic marauding in the space that Sterling had in this game, and Oscar harassing Gerrard, I can’t see where Liverpool’s strengths will come from. Keep in mind that a draw does not push Chelsea towards a championship. If they draw at Anfield they will most likely face a situation when they are 2 points behind Liverpool and 3 points behind City coupled with inferior goal difference to both of those teams and only 2 games to go. The game at Anfield is a must win for Chelsea and they can’t afford to sit content at 0:0 like they usually do away against the better PL sides. Deep, insightful analysis as usual….but one thing…Aguero a straightforward striker?? i can’t believe that you said it Michael….Kun links up play superbly and devastating as a striker. His pass was not over hit, just that Silva was a tad late….Liverpool really nicked it but based on 1st half performance they deserve it! This and the first half performance against Arsenal a couple months ago were two of the best performances I have seen all year. When Liverpool are playing this well, I think they can give Madrid and Bayern a run for top team in Europe. Bold words, but I agree with you. I guess we’ll find out next year! I think you may be a little harsh on Fernandinho given the thankless task you mentioned. He has been brilliant and often was able to do the job of 2 midfielders quite adequately. The problem is that like many first year players in England the ridiculous schedule catches up with them and they see serious decline in the second half. It happened with Ozil this year and numerous others. Silva was the best player for the first half of his first season before fading sharply.